The seeds of a potential turnaround were sown in 2016, when the firm began to revamp its portfolio to match changing consumer needs. The worst is probably over for Coca-Cola. India’s largest beverages maker, which had been facing faltering sales in terms of volumes for more than a year, is getting back its fizz as its multi-front strategy seems to be working. The firm - now on a growth path - was till recently looking for ways of addressing dipping sales of its popular drinks like Coca-Cola, Fanta and Thums Up. But by September 2017, the cola major began to show recovery. Its volumes grew 6 per cent during the quarter. And by March 2018, it had three consecutive quarters of growth as its popular beverages portfolio grew by double digits. And in May 2017, it had considerably tweaked its strategy as a change of the guard globally paved the way for an all-round growth plan, which considered volume growth more seriously. Sources say its new global chief executive, James Quincey, came with a vision of growing Coke’s volume uptake in emerging markets like India, apart from keeping an eye on revenue growth. The strategy, unlike the one it replaced, needed Coke to focus equally on all aspects of the business - its product portfolio, bottling operations, distribution, and sales and communication. And, if required, make changes in any of them in accordance with local needs. “Last year we renewed our strategy of becoming a Total Beverage Company that offers consumers a wide choice of beverages attuned to their preferences. "As part of this journey, Coca-Cola India has introduced a number of unique initiatives in the past few months,” said a Coca-Cola India spokesperson. The India story is no different. Changes in its portfolio made sure that the firm left no space open for competitors at critical price points. To plug the gaps, it came up with smaller packs of juices and launched two fizzy drinks under Kinley to counter fringe players. And the upper tier of the pyramid was covered by expanding its premium portfolio - from Schweppes-flavoured water to Smart Water, Maaza Gold and variants of Minute Made juices. The mid-segment, which has been the stronghold, was further strengthened with Thums Up Charged - a variant of the bestseller with higher levels of caffeine. It is working on juicy variants of established brands such as Limca, Fanta and Sprite, apart from launching no-sugar variants of Thums Up, Coca-Cola and others. To boost its distribution, which covers some 2.5 million outlets out of some 10 million retail stores in India, Hindustan Coca-Cola, the bottling arm of Coca-Cola India, merged the two sales forces that were selling popular and juice-based drinks, respectively. 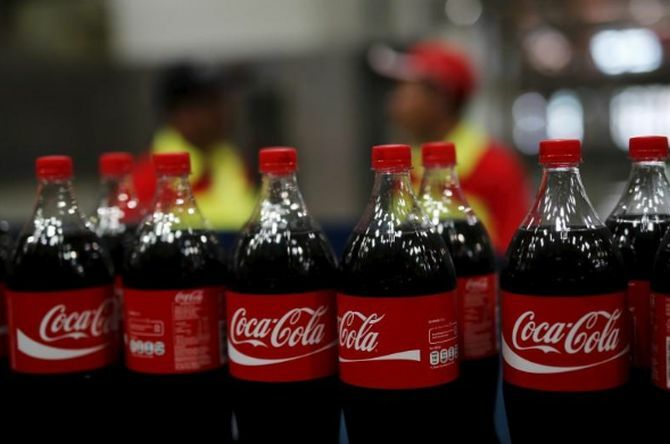 According to Asha Shekhar, director, media, Coca-Cola India, the firm is making a multi-pronged attack this time with different products pushed in different regions of the country.